My husband calls me 'Breakfast Princess' and although that sounds like a cute pet name, he's really referring to the fact that I make breakfast for dinner about 3 times a week. Sometimes I make a quick healthy version of breakfast and other times I go all out. 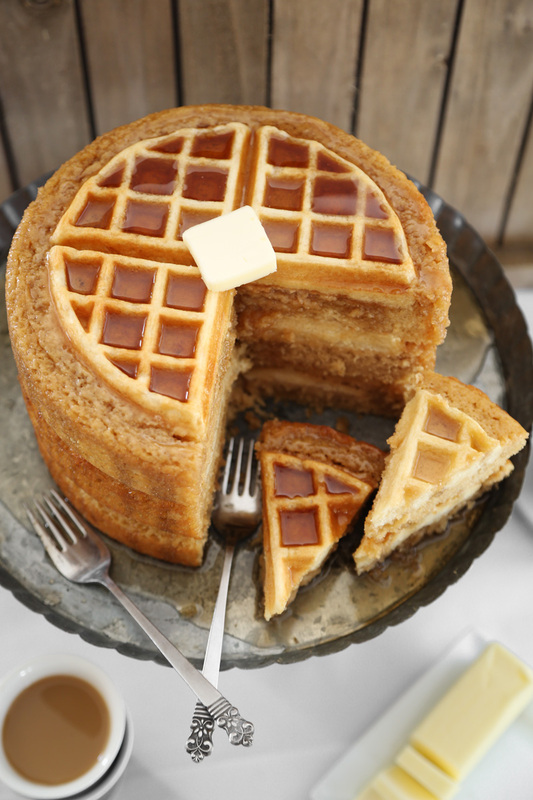 Many nights we have puffy Belgian waffles, and that's what inspired this cake! 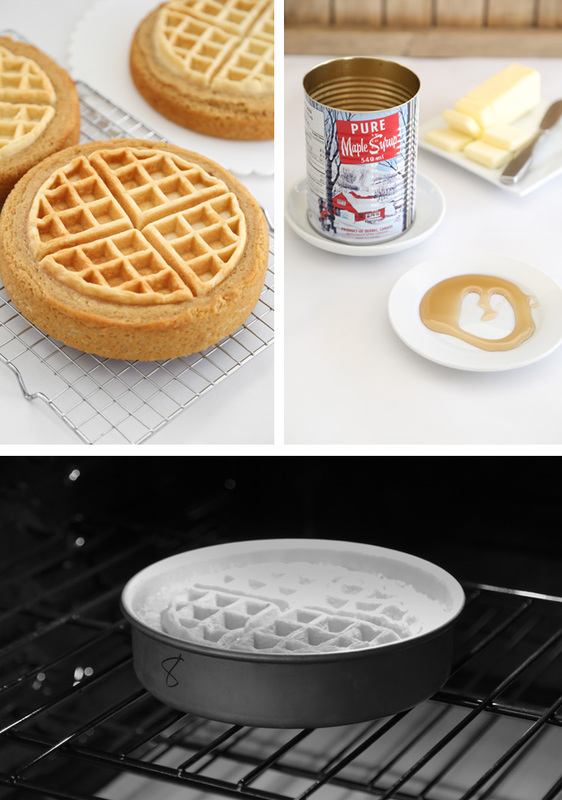 The idea came to me after I'd made a batch of Cabin Waffles, and my 8-inch cake pans were sitting on the counter right beside them. I noticed the pans were just a little larger than the waffles, and so the Belgian Waffle Cake experiment began. 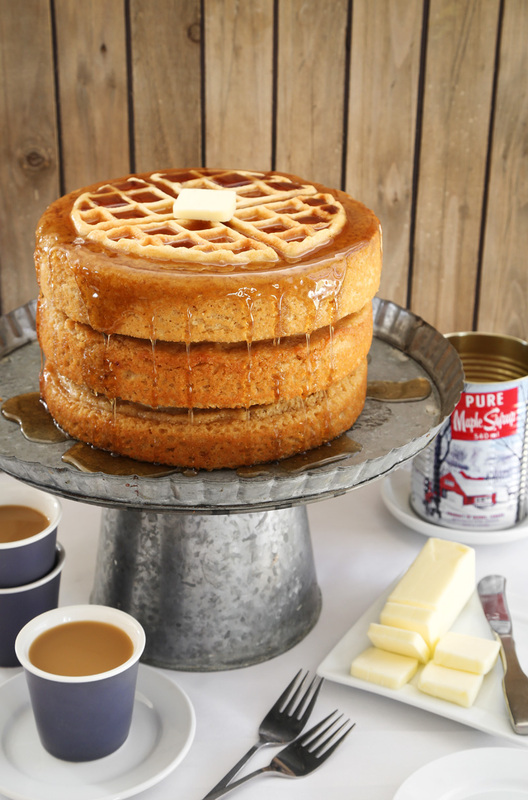 I whipped up some maple syrup cake batter and baked the waffles in three cake layers. I was surprised at how evenly the cakes baked. 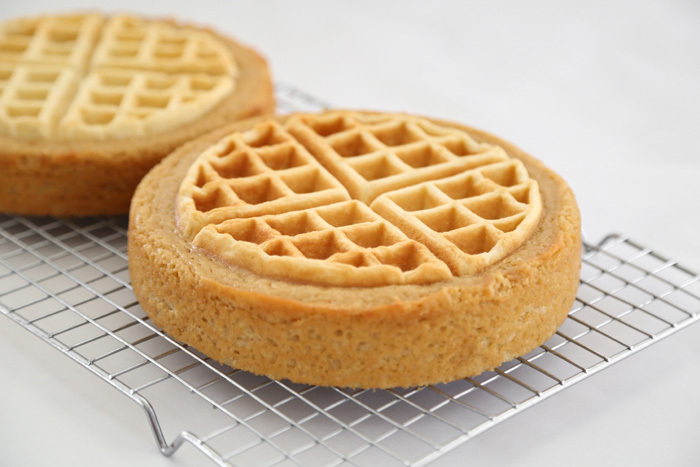 The waffles placed in the centers of the pans discourage crowning, so no leveling is required! You can find ready-made Belgian waffles in the freezer section at the grocery store, but I highly suggest making a batch of my Cabin Waffles (with buttermilk!). They are perfect in this cake. 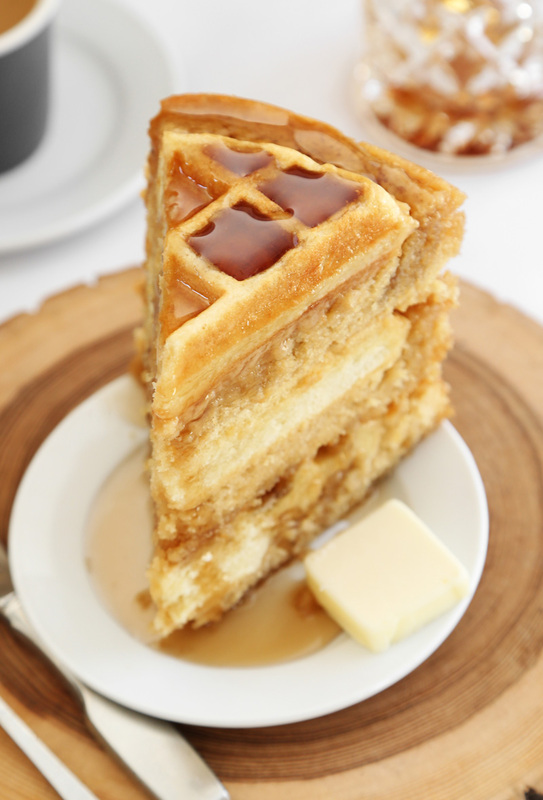 The tops of the waffles become crisp as the cake bakes. If your oven has a tendency to over-brown, place a sheet of aluminum foil over the cake pan before baking. I suggest using grade B maple syrup in this recipe. Grade B has bold maple flavor that holds up well through baking. You could use more maple syrup to cover the cakes, but I prefer to use the brand of pancake syrup I grew up eating. I am nothing if not sentimental. I'd whipped up a batch of maple frosting for covering the cake, but it absolutely did not need any additional sweetness. Each cake is covered with pancake syrup before stacking, so the layers hold together well when sliced. This cake is a true marriage of breakfast and dessert, and brings a whole new meaning to 'Eat Cake for Breakfast'. 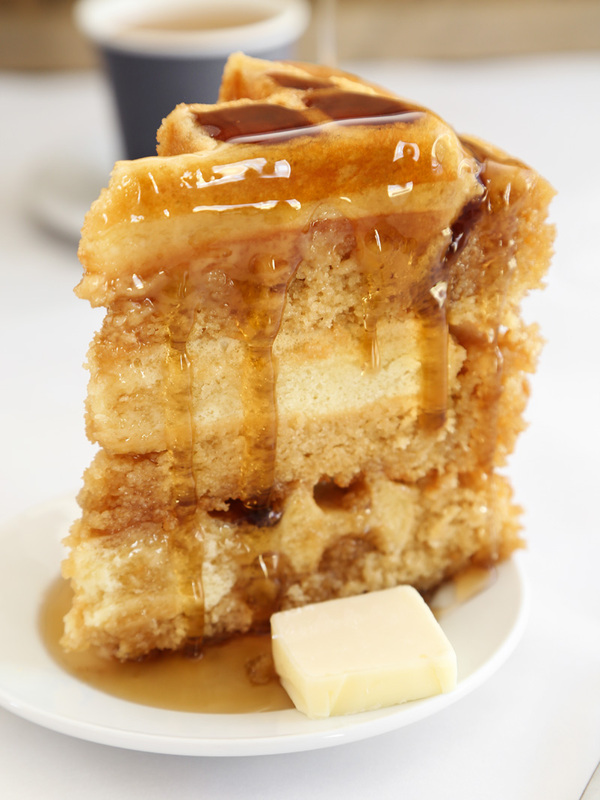 The maple cake is tender and the waffle center is slightly chewy, but soft enough to cut with a fork edge. It's lovely on its own but even more delicious with a cup of strong coffee, if you ask me. magnificent! you are my cake queen. I can’t even imagine what this must taste like! Okay, this is absolutely STUNNING and looks SO delicious! I love breakfast for dinner, too, and waffles happen to be one of my faves! You totally amaze me with your creativity, Heather! I want to try this recipe but I don;t really care for maple. Is there another type of syrup you would recommend for this? Being a breakfast princess myself I can't wait to try this! I have all of the ingredients so I may make it tomorrow! I can't wait! Thanks for your brilliance of combining breakfast and cake!!!!! This is perfect!! 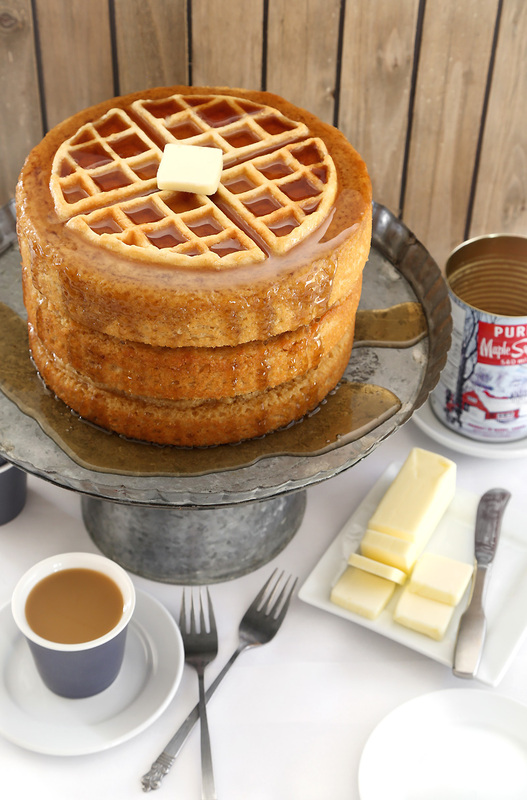 I'm in the process of planning my boyfriend's annual breakfast birthday party (he's a breakfast lover too) - every year we have a breakfast themed cake, and in previous years we've had a cinnamon roll cake and mini-donut cake - this year it might have to be a belgian waffle cake!! awesome I'm always on the lookout for something amazing like this breakfast cake, on my way to make it. .. Question did you fully bake the waffle or leave it a little under? Hi Valerie, I cooked them until lightly golden. They were done through their centers. OMG! This is so amazing! Love this! May I ask what brand of maple syrup that is? My husband had a can of it once and i used it one morning not knowing how special it was. I would love to be able to surprise him and replace it. Thanks!! Has anyone made this cake? How did it go? thank you for sharing this. i am so excited to make this for my family when we go to cabin next weekend. This looks amazing and I'd love to make it for a friend's birthday! Does it store ok or do you need to eat it immediately? really want to make this cake. would this recipe work using 9 inch cake pans? I think I'll start experimenting with this and if all goes well put it on my Christmas morning breakfast list! Thanks in advance. Did you use the maple syrup icing? One of the photos looks like icing is there but you didn't provide the icing recipe which I would love to use. Hi! I didn't use any frosting. I think you may be seeing the top part of a cake that piled up a little as it baked (like the bottom cake in the very first picture). This cake is a strong contender for my birthday... So creative. I would like to chime in with Anonymous, above, and request the recipe for the maple syrup icing. I could see a runny glaze-style icing or a fluffy, whipped buttercream that can be poured or dolloped onto individual slices as guests see fit. Heather, did you wrap the layers and put them in the fridge? Or leave them on the counter? With the humidity here, I'm concerned about mold.